SMS messages turn 20 years old today and while the cell network technologies have changed, the usefulness of those 160 character texts hasn’t diminished. If anything it has increased – there are 8 trillion (yes, with a t) texts being sent each year. 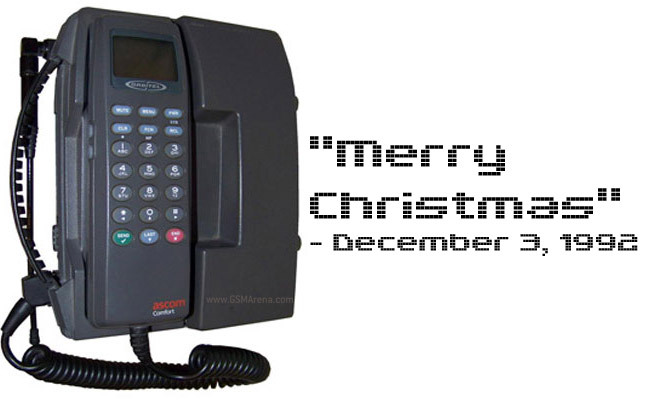 Twenty years ago on this date, the first SMS message was sent – the message read ‘Merry Christmas’, typed on a computer by Neil Papworth and sent over the Vodafone network to one of its employees, Richard Jarvis, who received it on an Orbitel 901 phone. If you try to look for that model on our site, you won’t find it – it’s too old even for our database. It looks more like a regular office phone (it’s pictured above) except it’s not wired to the wall. Anyway, Papworth was 22 years old when he sent the message and I commend him for not texting the way most current 22 year olds do (though then SMS talk wasn’t invented yet). “We thought SMS was a clever way for a company’s staff to send simple messages to one another,” says Papworth, “even if at the time the achievement was nothing remarkable.” You can read more of what he said to The Guardian. Today there are WhatsApp, Viber, iMessage, BBM and more competing with SMS but the simple service remains one of the most used on a mobile phone.